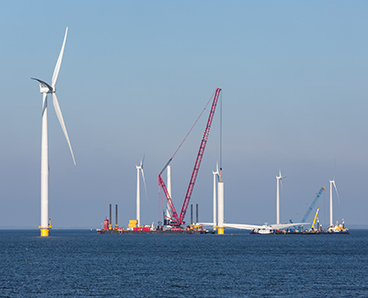 2H and sister company LDD worked together on the pre-piling template for an offshore wind turbine installation in the North Sea, ensuring safe transportation and minimizing the need for expensive winch equipment and vessel reinforcement. 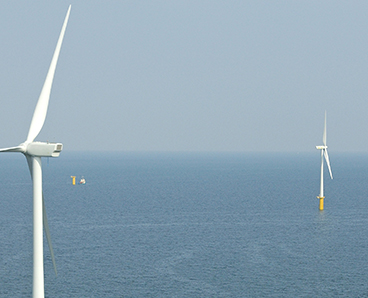 The Moray East Wind Farm is an offshore renewable project being constructed in the North Sea. The wind farm’s turbines have been designed as tripod foundations with pre-installed piles and installation is due to begin in May 2019. The positions of these piles must be extremely precise, so a pre-piling template is needed to site the piles correctly. The installation contractor needed to confirm that the template and winch system was designed to handle the dynamic loads beneath the transportation vessel during transit. They also wanted to mitigate impact loads on the hull to avoid additional reinforcement to the vessel. 2H’s sister company, LDD, led the pre-piling template design and wanted to use our expertise in dynamic subsea systems to ensure that the template would be safe during transit operations. Our objectives were to assess what impact was likely to occur during transportation of the template. Additionally, we were tasked with determining whether any further mitigations were required to prevent vessel damage and to specify the appropriate operating parameters and wire specifications for the vessel’s winch system to lift the template safely. Using the specialist subsea FEA software, Flexcom, we accurately captured the hydrodynamic loads on the template from wave, current and vessel transit. What made this particularly challenging was the position of the template under the vessel as it had to be located off-centre, to one side of the vessel. The asymmetry meant that the vessel roll from beam seas added additional heave motions on the template winch system, which increased the maximum tension in the wirelines. We took a two-pronged approach to this problem. Firstly, we reduced conservatisms in the analysis, of which the most significant was to run irregular waves. This brought the loads down to acceptable levels. Although this gave the greenlight for operations, with the reduced conservatisms we recommended suspending operations in a small number of wave conditions. This only reduced the total permissible operating window by less than 1%. 2H’s analysis helped define the final specifications of the winch system and sea fastening design and showed that additional costly winching equipment and hull reinforcement was not needed. We also demonstrated that the pre-piling template could be transported safely without damaging the vessel. The project is another example of Acteon companies drawing expertise from each other to work together seamlessly under a single contract. “One thing that really stood out was 2H’s ability to understand our requirements so quickly, which demonstrates your expertise within the offshore industry and the tools that you employ to carry out your analysis. It was reassuring to have you take part in discussions with our client, which has shown the effectiveness of having Acteon group companies working together.” Jamie Bentley, Engineering Manager, LDD.